Bespoke Construction Services Ltd are delighted to announce their newly awarded project for supermarket giant, Lidl. Situated in Exeter, this new venture will involve the full internal fit-out of office accommodation within a gigantic 50,000m2 warehouse. 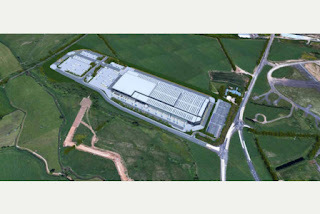 Once completed, this regional distribution centre will supply goods to all Lidl stores in the South West. Due to their extremely competitive prices, the popular German supermarket chain has experienced substantial growth in the UK and currently operate over 600 stores across the country. Commencing in January 2017, our extensive works package will include partitions, drylining, screeding, joinery and the installation of Owa ceilings. This ambitious development will also bring a welcome employment boost to the area, with an estimated 500 new jobs set to be created. To read more about this exciting new project, click here to read an article for the Exeter Express & Echo.